Water Management at "La Casa de Suiza"
Mexico, a country stretching from Guatemala's subtropical climes in the south up to the dry Arizona desert in the north, is continuously confronted with water shortages as well as polluted subterranean and surface waters. Last year, during the celebrations of the seventieth anniversary of diplomatic relations between Mexico and Switzerland, a privileged location was chosen for building La Casa de Suiza, a temporary thematic pavilion that hosted an ​exhibition about Switzerland's historical, cultural, and scientific heritage for the duration of two months. Louis-José Touron, the current Swiss Ambassador to Mexico, described the house as “a temporary and sustainable space that will enable the strengthening of bilateral links with Mexico, while at the same time opening spaces for Mexicans to learn a little more about our history, science, traditions, and gastronomy". 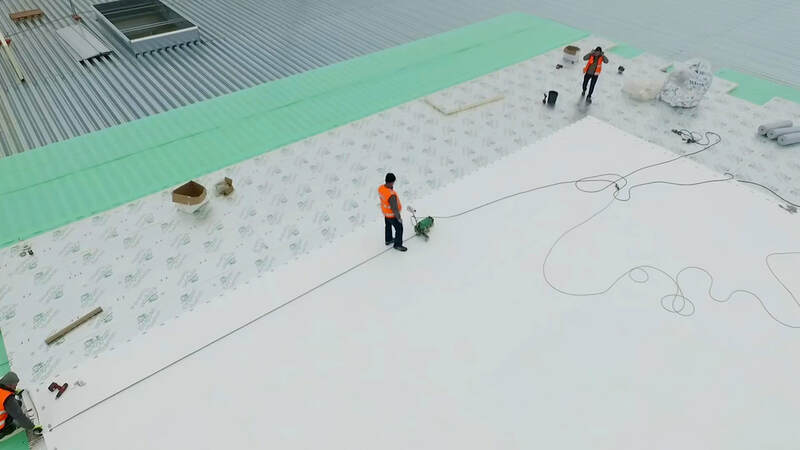 The roof membrane of the new Amazon Logistics Center in Vercelli, Italy, was welded with a Leister VARIMAT V2 in July 2017 of last year. 108,000 square metres of roof area - as large as 15 football fields – is a considerable area, for a roof and for a VARIMAT V2. The project lasted from February to July 2017 and welding was made more difficult by temperature fluctuations. Temperature fluctuations were caused not only by the changing of the seasons from winter to spring to summer, but especially in the summer by the change from day to night. The VARIMAT V2's welding temperature had to be adjusted through-out the day to counteract changes in the outside temperature; this ensures high quality welding seams that will not leak. With the closed-loop technology from LEISTER you are on the safe side when it comes to the quality of the welding seam. Why? This technology guarantees that the parameters remain permanently constant even in the case of voltage fluctuations. In this way you always achieve consistent welds under different conditions on the construction site.